Who Is Zimbabwe's New Leader, Emmerson Mnangagwa? A supporter of Zimbabwe's incoming leader Emmerson Mnangagwa holds his portrait while waiting for him to arrive at the ZANU-PF Headquarters in Harare on Wednesday. Emmerson Mnangagwa, center, greets supporters gathered outside the ZANU-PF party headquarters in downtown Harare, Zimbabwe on Wednesday. 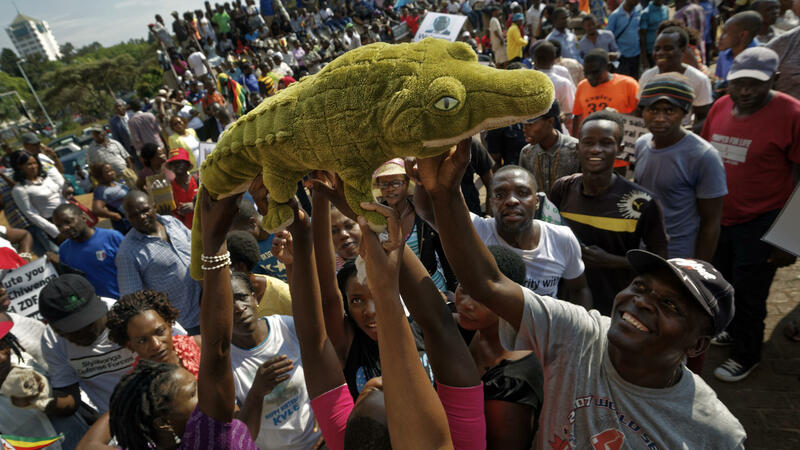 Supporters of Zimbabwe's Mnangagwa, known as "The Crocodile," raise a stuffed crocodile in the air as they await his arrival at the ZANU-PF party headquarters in Harare, Zimbabwe on Wednesday. Mnangagwa has emerged from hiding and returned home ahead of his swearing-in Friday. Crowds gathered at the ruling party's headquarters for his first public remarks. 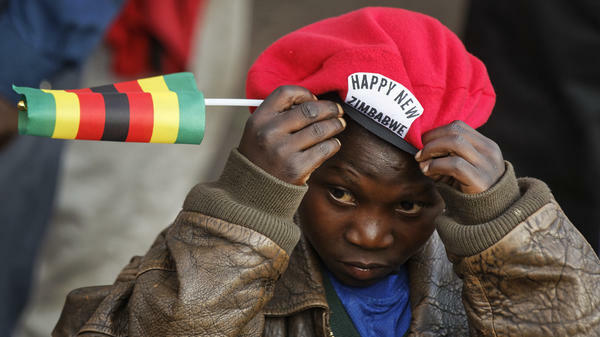 A young supporter of Mnangagwa adjusts his beret as he awaits his arrival at the ZANU-PF party headquarters in Harare, Zimbabwe on Wednesday. "The Crocodile," "The Enforcer," "The Bodyguard," "The Spymaster." Those are just some of the names Zimbabwe's new leader goes by. One could also add "The Survivor." The nicknames are an indication of what Zimbabweans can expect of Emmerson Mnangagwa, who is 75, and poised to be sworn in as president to replace his one-time mentor Robert Mugabe, on Nov. 24. As a young 18-year-old recruit to the independence liberation struggle, Mnangagwa was condemned to die by the Rhodesian authorities the guerrilla warriors — combatants and strategists — were trying to depose. On Nov. 6 2017, Mnangagwa faced another challenge: He was fired as vice president by former president Mugabe — a decision that led to the rapid unraveling of the veteran leader's 37-year rule. The military chief refused to accept Mnangagwa's dismissal and warned the army might intervene to restore stability and end political chaos in Zimbabwe. The next day the military, which is an integral part of the governing ZANU-PF party behemoth, seized control and confined Mugabe to his residence. By then Mnangagwa, once touted as Mugabe's heir apparent, was long gone — to neighboring South Africa in temporary exile, saying he feared for his life. In a letter to Zimbabweans, he pledged he would be back "to lead" the country. This was after the erstwhile ally of Mugabe had been vilified and accused of using witchcraft to plot the ouster of the president who was once his mentor. The most virulent insults came from the first lady, Grace Mugabe. Commentators agree she was gunning for Mnangagwa's job as vice-president and harbored presidential ambitions herself as she scooted up the political ladder, becoming head of ZANU-PF party's women's wing. When Mugabe refused to resign and was threatened with impeachment, the party he had lead for almost 40 years accused him of dereliction of duty and allowing his unelected wife to usurp state power. It appears the Mugabes overplayed their hand. Watching and waiting in the wings, Mnangagwa, as is his wont, said little while Zimbabwe witnessed a momentous week of unprecedented political change. The country teetered from euphoria, jubilation and peaceful protests, to demand Mugabe's resignation by noon on Nov. 20 — or face being impeached — to stunned disappointment and a momentary jittery panic when a defiant Mugabe addressed the nation on the eve of the ultimatum and made no mention of stepping down. History was on Mnangagwa's side — aided by the military and others in Zimbabwe's intelligence and security establishment, as well as politicians and party members who had, until just a week before his downfall, loyally backed Mugabe. As Parliament was considering a motion to impeach Mugabe on Tuesday, a letter arrived, which was read by the speaker, announcing the president had resigned. Pressure, people power, the military and pragmatism had pushed Mugabe out, avoiding the humiliation of the 93-year-old being impeached. Cheering, euphoria and celebrations once again, for the second time in four days, on the streets of the capital, Harare. Mnangagwa, The Crocodile, had bided his time and wrongfooted and outplayed the master strategist, Mugabe — the teacher he had studied and learned from over decades. When the moment came for The Crocodile to snap shut the jagged jaws of the predator, and drag down 37 years of Zimbabwe's history, Mnangagwa proved he had become the master. Andrew Meldrum, author of Where We Have Hope, a memoir of his 23 years as a journalist in Zimbabwe until he was kicked out in 2003, says "Emmerson Mnangagwa has a checkered history." Now acting Africa editor for The Associated Press, Meldrum says in the weeks before Mnangagwa was fired he was denounced by the Mugabes. "They demonized him in public, sometimes when he was present, talking about how he had affairs with other women and how he had had some people pushed out of windows and saying that he was plotting against them with witchcraft," Meldrum explains. He says Mnangagwa must have been aware that they were preparing to remove him from government, as the same thing happened to another vice president and war veteran, Joice Mujuru, who fell out with the Mugabes four years ago and was forced to resign. "Mnangagwa has been careful to foster good relations with the army, with the top generals, with the state security that he ran for many years," Meldrum says. "He's had good relations with all of them and, that's why, after he fled the country we saw within days the army generals took action to put Robert Mugabe under house arrest." But who is Mnangagwa? And what sort of leader might The Crocodile make? Some describe him as the sort of man who, with one withering look, makes your blood run cold. "Unlike Mugabe, Mnangagwa does not have public charisma and he's terse in person," Meldrum says. "And he has a heavy-lidded gaze that some say is sinister. He's not an outgoing person that fills up a room and works the room like a politician. He's there and he just watches. He was like a kind of eminence grise, he was was always there, like a looming presence." Mnangagwa is, in many ways, the antithesis of charismatic, articulate Mugabe, though he learned his craft from his longtime mentor and fellow veteran of Zimbabwe's independence liberation war. For years, Mnangagwa, widely known as The Crocodile because of his reputation as a ruthless and skillful political operator, was a leading cabinet minister, appointed as vice president by Mugabe in 2014. But the two go way back. 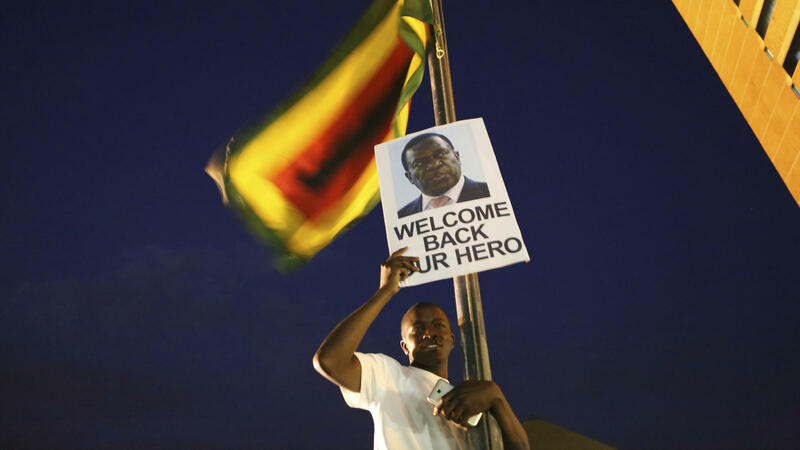 "Emmerson Mnangagwa is one of the original people who began the war to free Zimbabwe from white supremacist rule," Zimbabwean journalist and Africa commentator, Michelle Faul, who has reported from the region for years, told NPR's Michel Martin recently. "He has long been considered the most probable successor and he's probably the key mover behind the coup that we saw. The firing of Mnangagwa opened the way for Mugabe's wife, Grace, to try to become the president of Zimbabwe." Meldrum says 75-year-old Mnangagwa "characterizes their relationship as father and son." "Mnangagwa worked for more than 40 years as Robert Mugabe's right-hand man and he said he learned a great deal from him," the author and journalist explains. "And also he was known as Mugabe's 'enforcer.' In the guerrilla war against Rhodesian rule, Emmerson Mnangagwa was his personal assistant and his bodyguard." He later became Mugabe's spymaster, as minister of security then later as head of the Central Intelligence Agency. Faul recalled the reputation for repression that Mnangagwa acquired post-independence, in the 1980s. "Oh, I think Mnangagwa certainly causes more terror in Zimbabwe than Mugabe," she said. "He is the man that is considered the orchestrator of the killings we call Gukurahundi, of the minority Ndebele people. Mnangagwa went on to become head of the CIO — the Central Intelligence Organization — another much feared agency in Zimbabwe known for disappearing people, picking up people, torturing them. You might live, you might never be seen again. ...I'm Zimbabwean... And we are celebrating, but we need to be cautious. This is not a revolution to bring reform." Are there any positives to Mnangagwa? Meldrum says, although Mnangagwa has a fearsome reputation, "he's a very smart operator, he's astute... it appears that he knows what is needed for good governance and good economic management, but it's in the balance and we'll see." And, Mnangagwa has been waiting. "He's been tipped by many people as Mugabe's likely successor. He's been waiting for this opportunity, so he went along with everything because he thought he would get the chance to become president," Meldrum says. "So when he was being elbowed aside by Grace Mugabe, because it looked like she wanted to become the next ruler, he took action to take what he had worked for for many years. Whether right or wrong, that's not how a politician or an operator thinks. He's doing what he has to do." And, says Meldrum, contrary to his often dour outward expression, Mnangagwa "does have friends. Those who know him say he can be very charming in a relaxed setting, in a one-to-one setting. And he has friends from all races. So there are interesting things about him." But Zimbabwean commentator Faul says many people are cautious: "I have been speaking to people at home. They make the point – all these people have blood on their hands. All of them." But, she adds, "Mnangagwa is seen as someone who has good business acumen, who understands the need for foreign investment... and who, recently, has been making surprising noises about things like inviting the white farmers who were forced off their land to return to Zimbabwe and also has said he's willing to work with the opposition," she said. 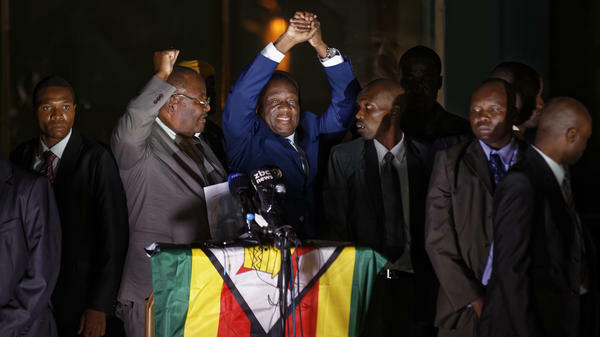 Mnangagwa returned to Zimbabwe Wednesday, to an ecstatic welcome from ZANU-PF supporters at the party's headquarters in Harare where he addressed them and promised change. The crowds chanted "Welcome Back Crocodile," in the local Shona language, and held up banners saying "Welcome Back Our Hero. Welcome Back Our President. True to your word, you're back." Other banners thanked the military, that has given Mnangagwa its backing, and fellow war vets. Mnangagwa thanked the crowd for its support and said he was humbled. Then, in a voice that carried across the outdoor setting, he said, to loud cheers: "Today we are witnessing the beginning of a new, unfolding democracy in our country. I wish also for all genuine patriotic Zimbabweans to come together. We work together. No one is more important than the other. We are all Zimbabweans. We want to grow our economy. We want peace in our country. We want jobs, jobs, jobs." But when he spoke in Shona, he said "anyone who's leading the country should not be opposed." And those who have reservations about Mnangagwa note that this is the sort of message Mugabe used to trot out. This is more of the same, they say, and that it was an arrogant speech because Mnangagwa was bragging that the ZANU-PF party is more or less the only show in town. Many Zimbabweans are wary of an erstwhile lieutenant of Mugabe's taking over — and they're no longer afraid to voice those concerns. Loudly. Speaking after a rally at Africa Unity Square in central Harare, on the day of Mnangagwa's return, Godfrey Mwazweyi was one of many people attending who were calling for real change. "I felt very proud of what we've done," Mwazweyi said. "The problem was that Zimbabwe was a country of fear — more repression than freedom. For the past 30 years, we have not been living in a free Zimbabwe." "At least now there's hope of a better future although I'm suspicious of what is going to happen, because nothing is still clear. There is still uncertainty for the future, because this is just a change of hands," Mwazweyi continued. "It's the very same people, the suspicious people, it's just a change of hands and I'm still not comfortable. We still have a long journey to go. Provided the incoming leaders are prepared to change for the better and are not greedy and are people-centered, I think we have a brighter future." Journalist Faul says Zimbabweans are demanding change, after 37 years of Mugabe and his elite, including Mnangagwa, so he will have to live up to his pledges. "They're seeing this as a sign that Mnangagwa realizes you cannot continue the type of despotic, greedy, corrupt rule that has become the order of the day in Zimbabwe. And that's why Zimbabweans are optimistic," she continued. "No matter who's up there, the end of Mugabe has got to mean, we believe, that something better is coming."